This entry was posted on October 23, 2011, 7:58 am and is filed under Electronics Projects, HAM Radio, Projects, weather. You can follow any responses to this entry through RSS 2.0. You can leave a response, or trackback from your own site. This is a very cool system. How to buy this receiver? The best way is to check https://www.kb9yig.com/ often, and look for the “Ensemble VHF” receiver. They go fast, so you should join the “softrock40” group on yahoo groups. When the kits are available, a message will be posted on the mailing list. It’s an involved process, time wise, so be warned. It’s totally worth it, though. Have you had success with this antenna? Did it turn out to resonate at 137 MHz? Is the design frequency 137 or 137.5 MHZ? Does it make a difference performance-wise if you use 1/8 inch tubing versus wire? Do you have any advice for easier ways to bend the tubing or wire? What type of coax did you use for the balun? Do you think this would work OK with an RTL-SDR “dongle” type receiver as sold by Nooelec? I haven’t measured the resonance frequency of the antenna. I built it well before I had a spectrum analyzer to perform the measurement, and now that it’s installed on the roof, I’m not really comfortable putting RF power into an antenna aimed at satellites. It does perform very well on 137MHz, however. To bend it, I just did it by hand carefully and taking my time. I imagine that bending pipe would be significantly more difficult. The coax I used for the feed line and balun was LMR-195 from Andrews Microwave. I got it surplus. It’s basically RG-58, I think. Thanks for the reply. Your design looks like one of the easier ones to attempt. Should the QFH calculator be set for 137.5 or 137.0? Are you using an LNA? Nice picture on the Twitter page! Could you send me an email so that we can talk that way? I don’t think it makes all that much difference between 137.5 and 137.0. 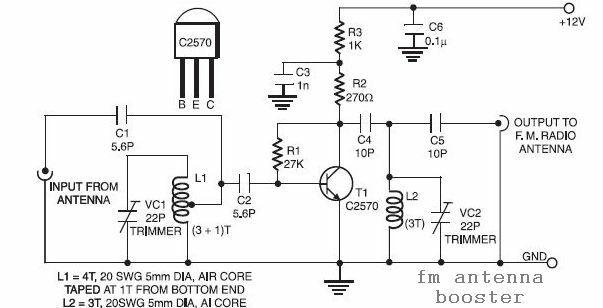 I am using a simple pre-amp circuit that I found online ( http://electroschematics.com/wp-content/uploads/2009/04/fm-antenna-booster.jpg ). It works O.k., I had to experiment with the coils a bit to get the tuning just right. I just (as of yesterday) assembled the parts to make some new LNAs with the skyworks SKY67015. I’m expecting to make a blog post about that when I’m done. I don’t like to correspond using email, because the point of this whole thing is sharing knowledge with as many people as possible. I typed a reply a bit ago, but I don’t see it now. I was at the local hardware store and looked at #4 bare copper wire and 1/4 inch copper pipe. I see now that you used #10 wire. I may need help with the QFH calculator web site if I go ahead and build this antenna. I think I may use thin acrylic rod or tubing for the central supports. How do you drill a hole in 1 1/2 inch or 2 inch PVC pipe so that the exit hole is exactly opposite the entry hole (using a drill press)? I found that one uses a v-block for drilling holes in round stock or pipe. I may need to make one out of wood for drilling large diameter PVC pipe, though. I made acrylic supports out of flat-stock and a scroll saw. It didn’t work fantastic. Acrylic is pretty brittle… I would choose almost any other way of doing supports. I think that tubing or rod would be a much better choice. Yes, you can use coax as the “arms” of the antenna. That is a common method for building QFH antennas. There are examples for how to wire them in such a way. I don’t have any links handy, but they’re out there. Good luck. I used grounding wire, so it’s solid copper. I used my hands to bend it. No ticket, no website…. just fooling around with RTL-SDR. I can watch every commercial airline in the country (and elsewhere) on FlightRadar24, but it’s not the same as watching 8 or 10 local aircraft on a homemade co-linear. And I can watch up to the minute weather conditions almost anywhere in the world, including over my head, all on Google Earth but, it’s not the same as getting that one feed from a NOAA satellite on a home made QFH. I have one question though Mister Dillon. When soldering the two elements together, with your coax, are you connecting one short to one longer element at the top? Or short to short and long to long? Thanks very much for the fine construction article and the link to the template builder. But, on that note, no matter what dimensions of pipe I attempted, absolutely none of the templates fit the particular pipe. In every case the circumference indicated for drilling holes was too short for the circumference of the pipe. It was easy enough to work around, I think, we’ll see soon enough. p.s. I’m going with short to long but I’ll keep it changeable by using some wire clamps viz soldering for the time being. The goal is for there to be one big loop. So, I think it is short to long. It’s interesting that I didn’t think to mention this. This site http://www.g4ilo.com/qfh.html has a diagram that is very hard to follow, but I think it is also short-to-long. Your photo of the antenna had the upper holes in the same horizontal lines, where as the drawing on the calc page shows all of the paired holes offset vertically. You stated the default conductor dia was 3/8 inch on the calc page. with same values as u stated u were using the default displayed to me is 50mm. That is not 3/8 copper tubing diameter. I am going to use the SD-Play, expecting it to arrive this evening. Trying to get a part list and cut pattern for the antenna right now. Yes, that’s right. The top holes are level. That’s a structure that I’ve seen rather often. Usually, the bottom holes are staggered. I know that the calculator has changed a bit since I made this page, so it’s possible that the defaults have changed. Also, it seems that some of the translations have gone a way, because I’m getting a lot of German now, and I don’t understand it. Whar RTL-SDR dongle are you using? A link or picture would be helpful. I doubt the one I have is still available. They’ve advanced since I bought them. However, this one seems to be well regarded. And did you use BNC to MCX converter/adapter for connecting the antenna to the SDR? I used SMA, but BNC would work fine if that’s what your antenna has. Thanks a lot! And prior to RTL-SDR what receiver were you using? I was using the receiver in the article. The “softrock”, but it’s no longer available as far as I know. And what was the length of the RG-58 cable for the down feed from the antenna to the receiver/SDR dongle? ive just made my own version of this ant but as i used wood dowels for supports and forgot to make copper links through..but i notice the coax version does not feed through support arms. all a bit confusing but there is different designs going round, but guessthey all work.. If bringing the drop cable in through a roof, make sure you put a little U in your cables as soon as possible. A couple of inches should do perfectly… and don’t let ANY other cables touch or cross the wire upstream of this. Without a drip-loop, water can flow down the cable into your receiver equipment… cross onto other cables nearby … or drip off the cable at random places – like over power supplies or mains sockets. By providing this drip loop in the middle of the shack, you can easily control where any stray water can get to. I’m extremely new to this, just got into radio a good week ago. I have only 1 question, does the type of wire used matter? Does it have to be 12 AWG solid copper? No, it doesn’t have to be. People use all kinds of different wire. The nice thing about the solid copper ground wire is that it’s stiff enough to take the shape and stay that way. Thank you so much for your article and design. I have constructed the entire design as described above. I just have one question: are the long and short loops soldered together? just a bit confused. Yah, they’re soldered together. That’s the photo of the top. The loops are joined and one leg is soldered to the braid, and the other to the conductor.